The world is a small place. It’s true. One may travel across the sea and happen upon a former classmate, an old neighbor, or even a step-sibling’s first grade teacher. It happens. True adventure does not only come from visiting the most grand places around the globe. One may find a spark of inspiration from the tiniest of towns, a road less travelled, or an unattended field. A friendly reminder, a stern demand, or a firm warning? You decide. Three digits. My favorite places to visit tend to have a population of three digits. I find that it is just enough to teeter on the brink of a Ghost Town while still maintaining culture and life. 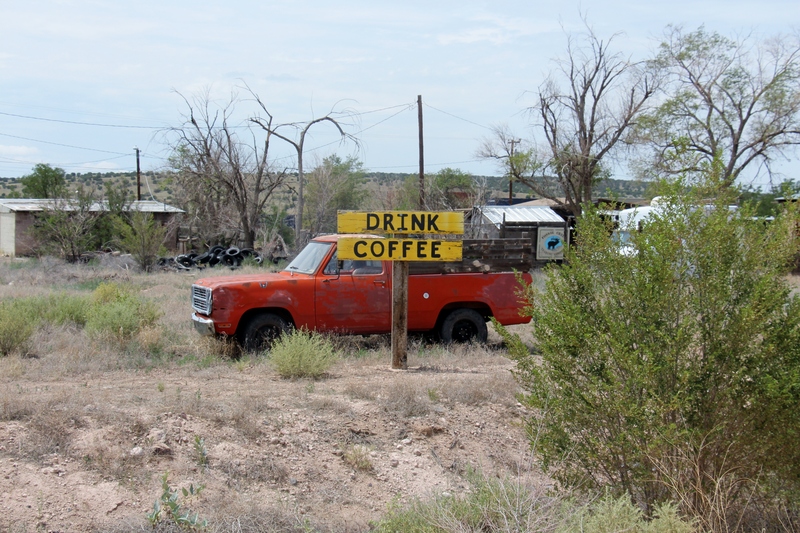 On my recent road trip down Route 66, I drove through many intriguing places. Some had long since been abandoned. Others simply had one working gas station, a dinosaur from the good ‘ole days. There were a few who had managed to survive the building of the Interstate. Not thrive, mind you, but they did have a steady pulse. Williams, AZ. How desperately it wants to be Las Vegas without gambling, 5-star hotels, or anything relatively fun to do. Williams had a nightlife of neon proportions. 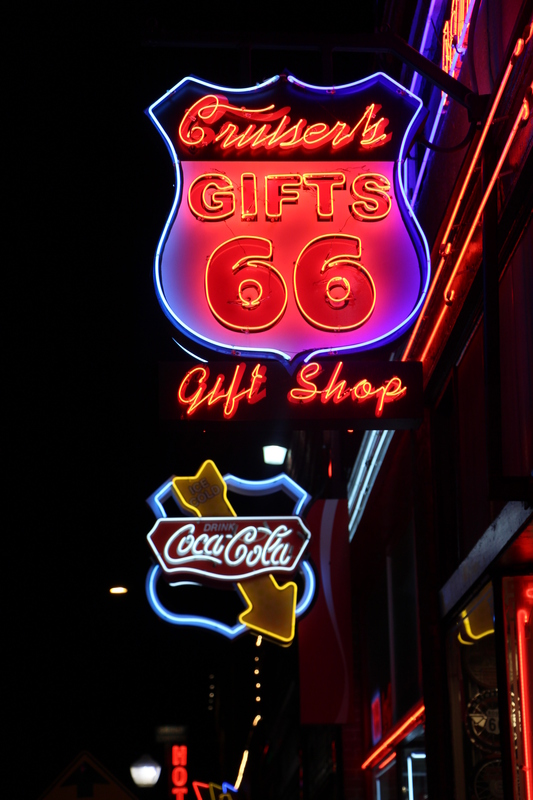 BBQ, live music, vintage Coca-Cola, and gift shops galore! Not a place for a vegetarian, such as myself, but a place nonetheless. I found great joy in rummaging through postcards and snapping photographs of antique signs. I can use these. After finishing up at the Grand Canyon, I made the two hour trip down to Williams. It isn’t too far from Flagstaff. Being extremely exhausted I didn’t have the energy or will power to fully enjoy the experience of the town. Didn’t realize how difficult it would be to catch a good shot of a neon sign. 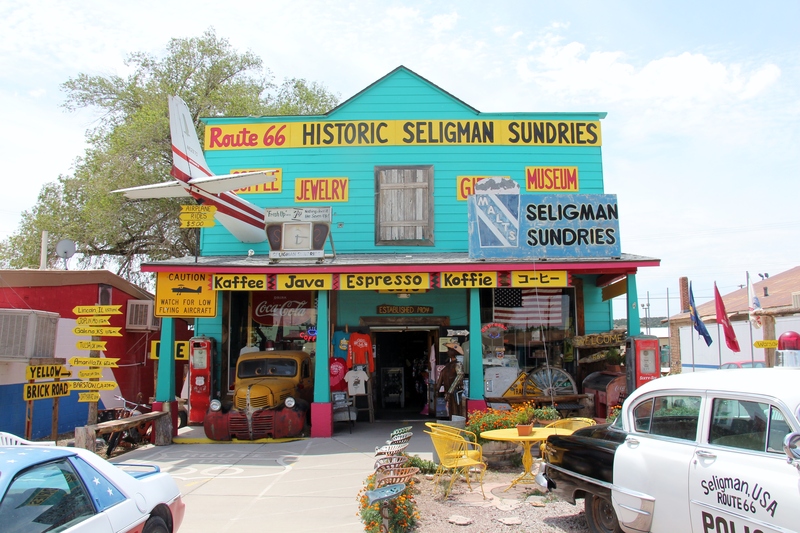 Seligman, AZ. This may very well be my favorite stop. On the journey back to Los Angeles, I made a point to spend some time here. I had driven through on my way in and took note to come back. What a grand little place. Time disappears. I found myself entranced by the endless photo opportunities. (Always take the time to snap that picture.) I lost myself in a spectacular gift shop where I spent over $200 on postcards, magnets, Route 66 merchandise, and an $80 Western Cowboy hat. So that’s how they maintain their healthy pulse! A band of Harley Davidson riders mowed through, stopping for some ice cream before heading back onto Route 66. In their own way, small towns are just as intriguing as big cities. While one may run out of things to do in a small town, one will never not have something to look at. How could you not spend $200 in here? I mean, there’s an airplane lodged in the the second floor.